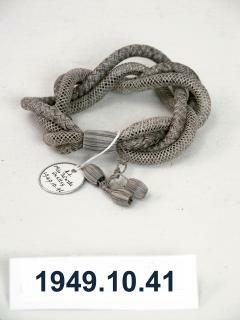 1949.10.41 Bracelet made from Mrs Farrer's plaited and netted grey hair in January 1867. Donated by Pastorella Shelley. 1954.11.55 Brooch of jet with metal pin. Flower design. Attitudes to death in England have changed considerably since Victorian times. Where once it was commonplace and acceptable to wear ornaments made from the enduring parts of relatives' corpses (that is, hair) it has come to seem unsavoury. [Hallam & Hockey, 2001: 4] We have now generally become more squeamish about death, we are much less likely to view the bodies of even close relatives once they are dead when once it would have been expected that neighbours and friends, as well as relatives, would have visited the corpse before interment. All cultural values are relative and shift over time and space, but in relation to death some of these values may change greatly over relatively small periods of time, or short distances. Even today, for example, the relationship the English have with the dead is different from that experienced in Scotland or Ireland. This web page examines only those practices and artefacts relating to death in and artefacts from England. Death is an event which like most life crises, is most likely to be associated with religion. For this reason many of the artefacts dealt with in these web pages relate to items relate to Christian burial practices. The Museum does not currently have an artefacts in its English collections that relate to other religion's death related customs. Many of the other artefacts associated with death in the Pitt Rivers Museum from England are from graves and were dug up during archaeological excavations. I will not consider these here, except to note that in many cultures in the world, and over time, people have been buried with items which will either be useful to them in the afterlife, or which were particularly meaningful during their lives. Although some people still follow this custom today our English ethnographic items, understandably, do not contain any such items. However, these displays do not, in general contain relevant artefacts from England. This second case does display several mourning ornaments made in England from human hair. 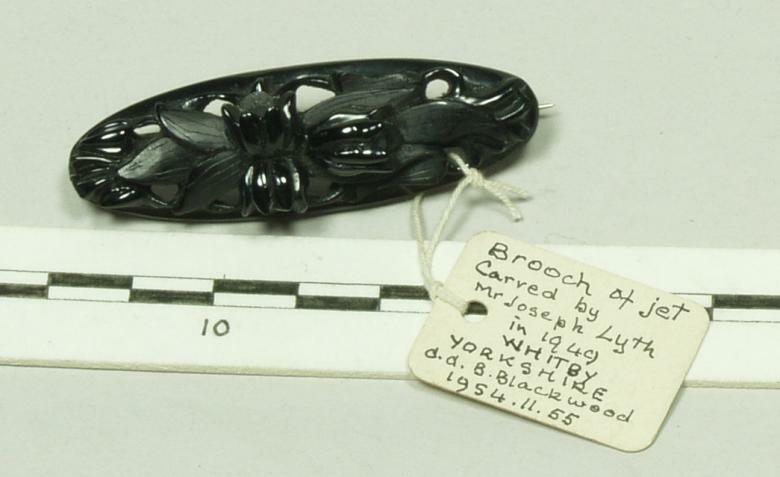 Most of the items relating to death in the Pitt Rivers Museum English collections were made or acquired during Victorian times, the zenith of the period when English people most closely grappled with the issues and customs relating to death. Although these collections are not extensive, they are diverse and interesting and cover most aspects that make this subject of abiding interest to many scholars. It would be interested to collect this type of object today in contemporary England where most people prefer not to think of death unless it is unavoidable, and avoid artefacts related to funerals and, most particularly, to dead bodies. It is likely that this public attitude will change again over time, indeed it may be that events such as the reaction to the death of Diana, Princess of Wales, in 1997 may indicate that change is already underway. The recent advent of memorial internet sites, and 'green' funeral may indicate more change. The Pitt Rivers Museum has many objects in it's collections that are related to the subject of death from all over the world, including England. Some of these are discussed in tthe following articles. Birth and death are the only certainties for all humans, and every culture has had customs and practices associated with burials and with the mourning of family and friends. Many of the English items in the Pitt Rivers Museum in this category come from the eighteenth and nineteenth centuries when there was a very strong interest in the customs associated with death and mourning. It is said that this interest was fostered by Queen Victoria's response to the death of her husband, Albert, in 1861. She wore mourning for the rest of her long life. Victorian society, at least from the 21st century perspective, appears to have been excessively governed by formal rules of etiquette. This was as true for matters relating to death as with all other areas of social life. Attitudes to death in England have changed considerably since Victorian times. Where once it was commonplace and acceptable to wear ornaments made from the enduring parts of relatives' corpses (that is, hair) it has come to seem unsavoury. We have now generally become more squeamish about death, we are much less likely to view the bodies of even close relatives once they are dead. At one time, it would have been expected that neighbours and friends, as well as relatives, would have visited the corpse before interment. All cultural values are relative and shift over time and space, but in relation to death some of these values have changed greatly over relatively small periods of time, or short distances. Even today, for example, the relationship the English have with the dead is different from that experienced in Scotland or Ireland. The following web pages examine only those practices and artefacts relating to death in and from England.